To nurture the success of schoolchildren, Denver schools are expanding a program focused on lifting up teachers. Denver Public Schools believes the Teacher Leadership and Collaboration program — designed to pair strong teachers with up-and-coming instructors for half a school day — has been working so well since its 2013 test run that it is being expanded to more than 60 percent of schools. In time, DPS acting superintendent Susana Cordova said Wednesday the district wants every school to move toward this teacher mentoring program or something similar. 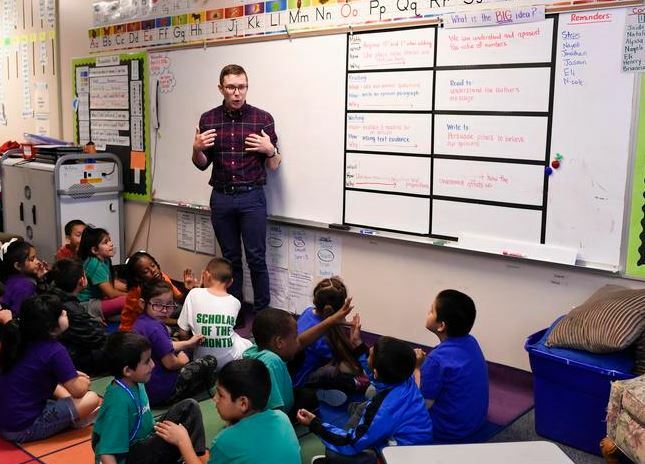 “Expanding the Teacher Leadership and Collaboration model across Denver Public Schools is going to provide equitable access for our teachers just as we strive to provide equitable access for resources and opportunities for our students,” said Joey Denoncourt, a second-grade teacher at College View Elementary School who spends half his day coaching first- through third-grade teachers in the classroom. Wednesday, Denoncourt spoke to a rainbow rug full of his second-graders on the ins and out of persuasive writing. The students’ engagement was palpable as their hands shot up in the air to answer questions and their eyes followed Denoncourt around the room. The control he has over his classroom can now be shared with other teachers and, Denoncourt said, his mentees can teach him a thing or two, as well. Lead teachers, selected for their “street cred” and a knack to be “instructional experts,” spend half the day teaching their classrooms as usual, said College View Elementary School principal Kyle Gamba. To cover for the lead teachers, the district has had to hire more teachers to take over classrooms for portions of the day. • In 2013, the Teacher-Leader Initiative began as a pilot program implemented in 14 Denver schools. • During the 2015-16 school year, the program expanded to 71 schools, with 245 teacher leaders working with about 1,200 teachers. • For the 2016-17 school year, the program will be rolled out in 114 DPS schools — nearly 60 percent — with a projection of 383 lead teachers working with around 2,400 teachers. • Ninety percent of teachers participating in the Teacher Leadership Collaboration in Denver say their teacher mentor has filled their classroom with a passion for student learning while facilitating teacher support that improves job performance, according to an all-staff survey. • Until now, the district has been funding the program 100 percent. • Starting in this fall, the participating schools will be responsible for funding 30 percent of the teachers’ salaries who fill in for the teacher leaders, and the district will cover 70 percent. • How ready are we for a project like this? • When do we feel we would be able to start a transition into getting teachers into small teams? • How many teacher leaders would we need for a school our size?